The Nook is a rustic studio-style two-room cottage ideal for couples looking to spend some quality time together in a private home with a relaxed wooded setting. 2 night minimum-except between Memorial and Labor Day weekends when we rent by the 6 night stay only, with Saturday arrival and Friday departure. The cabin’s main room is furnished with a queen-sized bed, a plush sofa and a television. This room opens to a four-season porch on one side and the eat-in kitchen on the other. The porch serves as a scenic sitting room with a love seat and coffee table and a serene view of the trees and nearby water on three sides. The deck is also furnished with a small desk. This beautiful glass-walled nook serves the added purpose of filling the rest of the cabin with a quiet natural light. The cottage’s full kitchen is equipped with place settings, cookware and full-sized appliances, including a fridge, stove, oven, microwave, coffee maker and toaster. A dining table and four chairs are nestled into the remaining space. Guests can open the doors on either end of this small cottage to direct a pleasant breeze through the rooms, giving it a quaint and restorative indoor-outdoor feel. The bathroom is located off the kitchen and includes a vanity and standing shower. The Nook enjoys a beautiful Wisconsin view of Lake Michigan, which is neatly in view from the cabin’s paved front deck area. Guests have access to two Adirondack lounge chairs and an outdoor charcoal grill to make the most of the pleasant, shaded property. Or, if you’re interested in some sun and an up-close and personal view — the beach is just a short walk from the front door. The Nook is situated across a one-lane road from a sandy walk-out beach on the shore of Lake Michigan. The beach is typically clear (if cool) and has a gradually sloping, sandy bottom that makes it ideal for swimming and wading. Guests are welcome to launch kayaks and canoes or just hang out and enjoy the sand and sun. 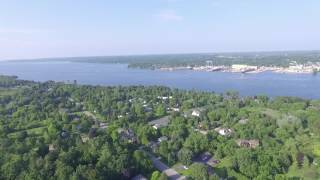 About a quarter mile to the north, visitors can access a public pier on the Sturgeon Bay channel where you can fish and watch the passing boats. If you want to venture further out into deeper waters, Lake Michigan is a great place to windsurf under the right weather conditions. 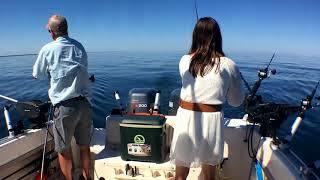 There are also nearby places to commission a charter boat or guided fishing trip. The roads and community surrounding The Nook are friendly and low-traffic, with neighbors made up of local residents and other vacation properties. Guests can feel free to walk or run in the area. There are also snowmobile trails nearby (as well as plenty of space to park trailers and recreational vehicles). Up the road from The Nook, visitors will find an entry point to the Sturgeon Bay Ship Canal Nature Preserve — here, you can explore more than 445 acres of protected land that includes beaches, sand dunes, ancient rock formations, aged trees and open fields. Don’t forget your camera — the moderate 2.5-mile nature trail meanders past two local lighthouses. During peak season (Memorial Day through Labor Day), The Nook rents at a nightly rate of $110.00. During the off-season, the cottage is available for a rate of $95.00 per night. Pet fees will apply, ranging from $15/night for dogs under 20 pounds to $30/night for larger animals. Puppies under a year of age are not permitted. A refundable $200 security deposit is required to reserve the cabin. Check-in is available starting at 3:00 pm. Check-out is scheduled for 10:00 am. Cancellations made a minimum of eight weeks in advance of the arrival date will receive a refunded deposit less a 10 percent (or $100, whichever is greater) processing fee. Cancellations made within the eight-week period will only receive a refund (less the fee) if the cottage is able to be re-rented. The three original properties that became Firefly Cottages were built by my father and grandfather in the 1950s. These charming, vintage homes enjoy a view of the water, settled across a quiet road from the sandy shore of Lake Michigan. My goal is to provide you with a comfortable, homey vacation home with lots of character — a place where you can make memories that will last. 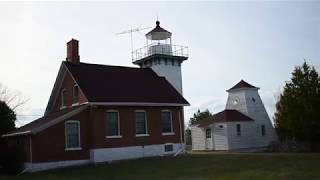 Bring your adventurous spirit and enjoy a traditional Door County getaway! And feel free to contact me (your host, Irene) for restaurant and activity recommendations.